The reason is quite simple. Most of us get married to be loved, not to learn how to love. I know you are probably reacting to that statement. I was convinced I was the best person in the whole world to love my wife. God had given her to me and I was the one who could love her best. I soon discovered there were some things my wife did that I did not know how to love. I soon discovered that my love was selfish. Along with my attempts to love her came my disappointment when she did not love me the way I expected. I discovered my love was rooted in selfishness. Our reasons for marriage usually have some flavor of selfishness, usually because we believe we will be better off, they will provide for me, they will give me what I need. Any marriage that begins with some semblance of selfishness (don’t they all?) will be in for some kind of adjustment. At some point your spouse will fail to do something which we expected or counted on. At some point we will encounter disappointment and even hurt because something we counted on did not get done. Marriage confronts our biggest sin – Pride. We all bring pride into our marriage, and because of our pride, we have expectations and those expectations will be disappointed, because our spouse also has pride and selfishness. The experts told ‘melittledina’ she needs to divorce her no-good husband for the protection of the children. Obviously Christ was not in their family. Even if ‘Melittledina’ had been a Christian, she probably would have divorced her husband. She had discovered that he had serious character flaws. He was not meeting her expectations. 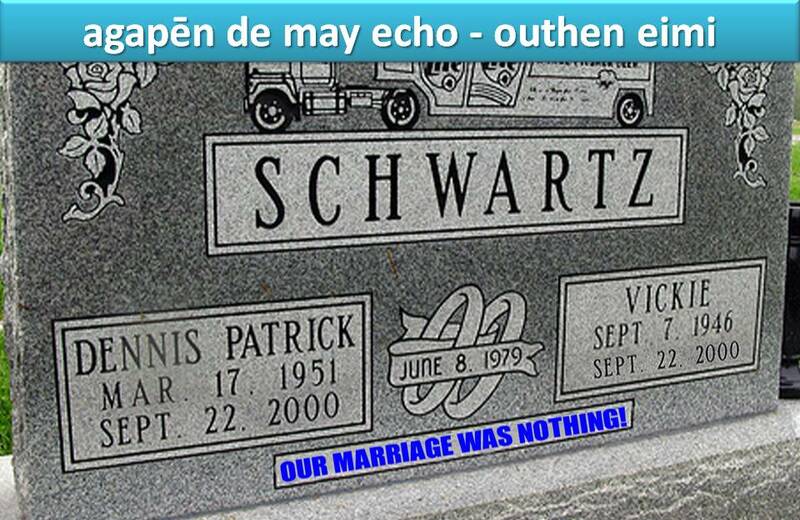 She still loved him, but she was no longer in love…she wanted out of the marriage. She had married for love, but she did not marry to learn how to love such a seriously flawed man. Most of us enter marriage with dreams and expectations. At one time we were active in our love for our spouse. Then, like ‘melittledina’, we start to see character flaws, some very serious. Then, disappointment, hurt, and bitterness build up stumblingblocks to our love. The truth is that we have this concept of “soul-mate” floating around our sub-conscious. Plato taught this before Christ was born, that somehow our souls were torn in two and there is someone out there with the other half of our soul. We get married because we think we have found our “soul-mate” and it is just so easy being around them. We have fun, we laugh, there is nothing forced about our relationship. We genuinely believe we have found the one God meant us to be married to the rest of our lives. Love is largely a feeling that produces long conversations, walks in the park, long slow kisses, and gentle touches. Our feelings are magnified to the ‘nth’ degree. We are constantly floating on clouds. Then we get married and life happens. Life is not easy, it is very difficult. The clouds evaporate, the long slow kisses become short little pecks, the walks in the park become falling asleep on the couch. After months or years, as our disappointment grows and the trials increase, we find ourselves wondering about our “love” and where it went. You tell your friends that you still love your spouse, but the love has changed. The feelings are not there. You wonder about this “soul-mate” thing, especially when days go by without intimacy or involved conversation. 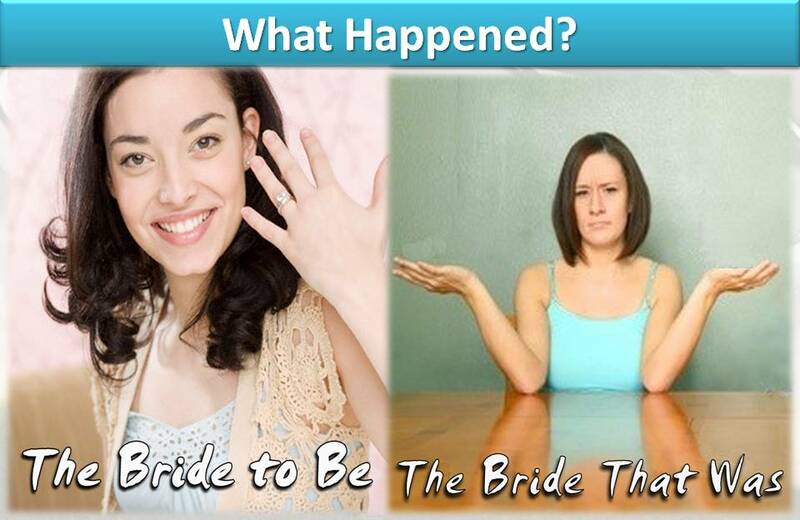 Do you know the difference between the bride to be and the bride that was? It’s not the veil, or the dress. It’s your attitude! A bride to be will not hesitate to tell you all the wonderful things her husband to be is. She can go on for 5 or 10 minutes about “he does this” and “he does that”. In fact, we discover we have “fallen out of love” and may have thoughts of moving on. It is a difficult situation when husbands and wives no longer feel they are in love with their partners, or no longer feel that lovely intimate connection they once enjoyed. It is at this point we are susceptible to outside influences that promise more excitement than we have at home. This situation and thinking can lead to affairs: emotional, cyber, or physical intimate relationships outside of the marriage. This is one of the most harmful and damaging of all behaviors in a marriage, potentially ending the relationship and destroying a family. 1. 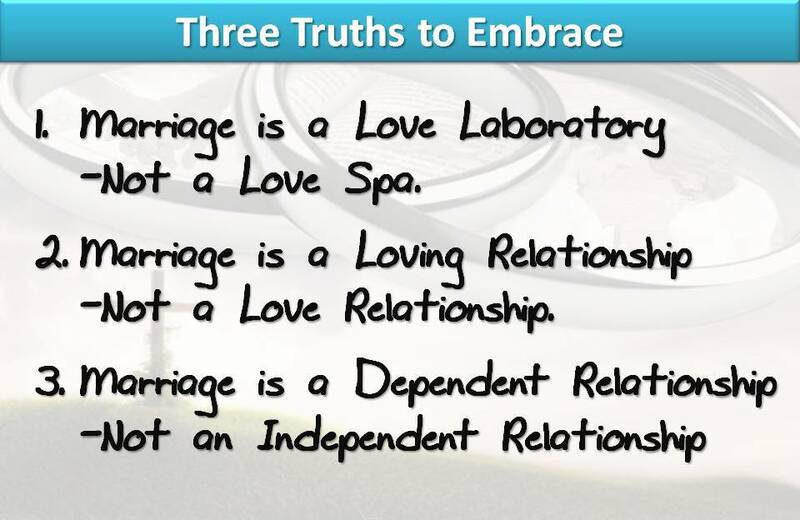 Marriage is a Love Laboratory, Not a Love Spa. 2. 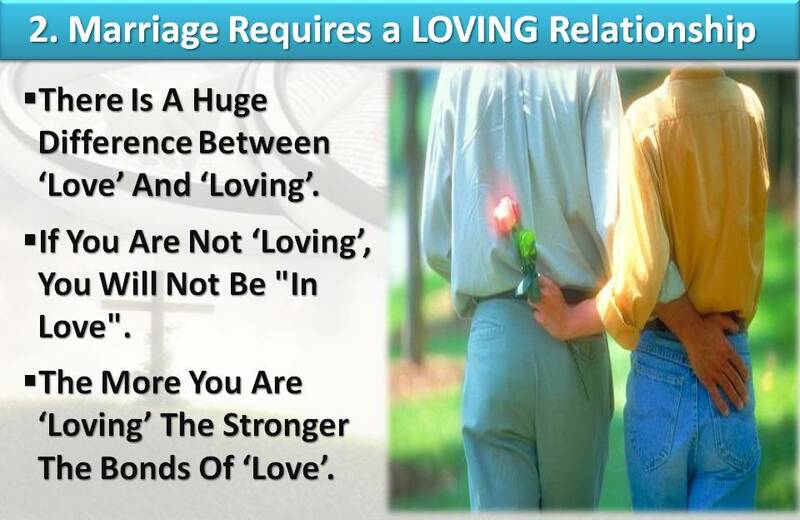 Marriage is a Loving Relationship, Not a Love Relationship. 3. 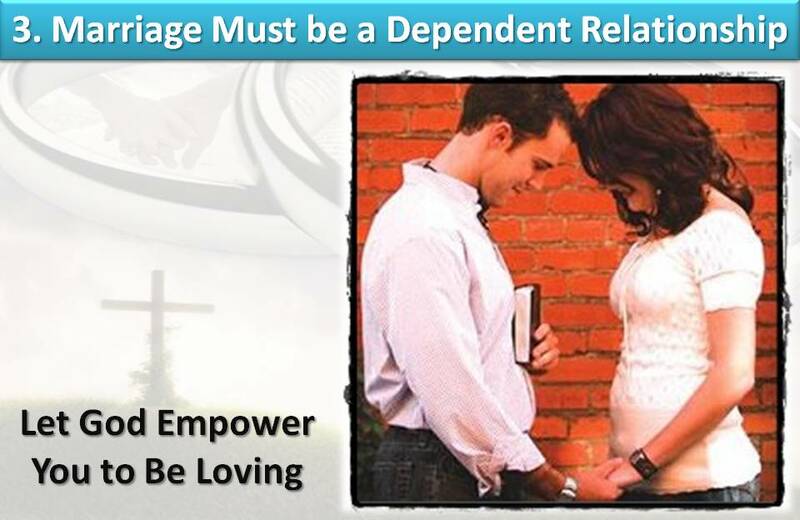 Marriage is a Dependant Relationship, Not an Independent Relationship. Marriage is not designed to be a series of Spa Days. You just can’t lay there while your spouse massages you 24 hours a day. In fact, most folks that have been married any length of time will tell you that marriage takes work. Now I’d like to challenge that idea just a bit. Most of us don’t associate “work” with fun and excitement. Most of us “work” to survive. While we certainly have to invest our energy, time, and effort into creating a healthy marriage and while creating a healthy marriage is not easy or simple, I believe it is better to see marriage as an open laboratory that requires our energy and effort to produce a beautiful and fulfilling and loving union. This laboratory is constantly finding what the marriage needs for proper nourishment through the various stages of life. Summer, winter, Fall, Spring. This laboratory requires 24/7 commitment, because the marriage is a delicate creature. This laboratory is a busy place, because the effort to keep the marriage flourishing requires persistence and endurance, as one who runs a marathon. 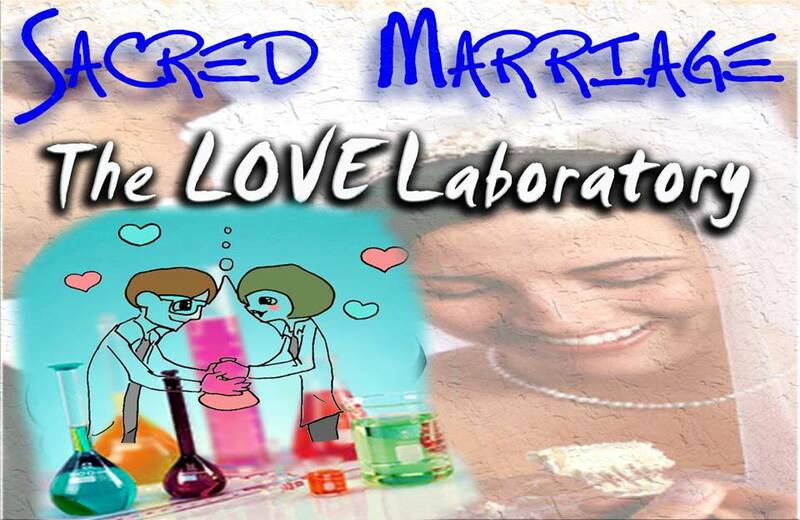 This laboratory requires dedication, because the studying of marriage is a constant and on-going process. This laboratory requires creativity, because the marriage is constantly transforming into a different form requiring creative care and adjustments. Each day there are new variables that require our constant attention to this relationship. You can’t let your guard down, this is a 24/7 situation. 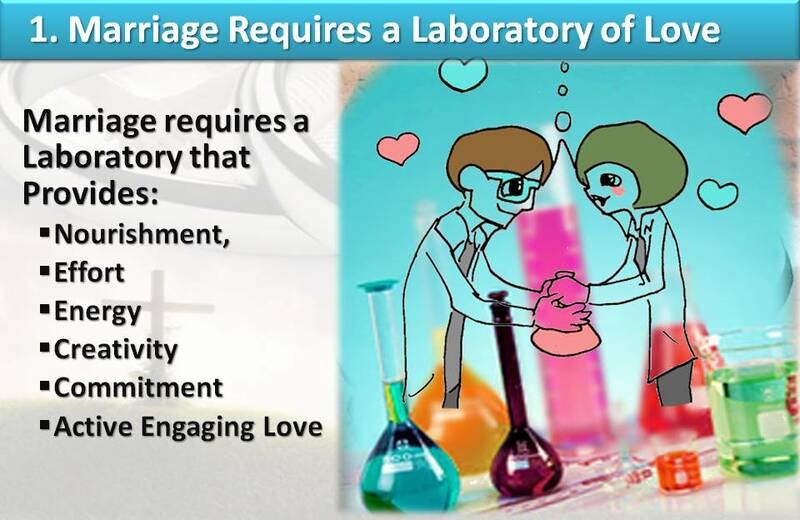 Marriage requires a Laboratory that provides nourishment, effort, energy, creativity, commitment… and most of all love. 2. Marriage requires a Loving Relationship. There is a huge difference between love and loving. We often, and in the above situation use the word, “love” to describe a general feeling of care or sisterly/brotherly love. “Love” could be used to describe ones feeling for the neighbor down the street or a stranger across the planet. It is a nice word that denotes concern and perhaps even a degree of empathy. In the past this form of love was called “philos” meaning deep friendship. When a person says they love their partner but are not in love, these feelings are often that to which they refer. Loving, on the other hand is completely different. It is a powerful verb meaning you are doing something. You are acting. You are involved and active. It is a participatory word. Take a minute and ponder what it means for you to be loving. What sorts of actions do you do when you are loving another? Perhaps you are engaging in sexual intimacy? Maybe giving gifts? Maybe being kind and considerate? Maybe you are complimentary or demonstrating love in some way? If you are not “in love” with your partner it is because YOU are not loving him or her. When a woman says, “my husband is a nice man but I am no longer in love with him”; it means “I care about my husband but I am not LOVING him”. In other words, to truly be “in love” requires you to be actively loving your spouse! If you are not loving, you will not be “in love”. This is a simple idea yet can have extraordinary impact on a relationship. Too often people have the mistaken notion that being “in love” just happens. This is just not so. Remaining in love with someone requires you to be loving. It requires you to engage in the relationship in loving ways. You must demonstrate and bring love to the relationship. The more you are loving the stronger the bonds of love. It was Jonathan Swift, the satirical author of the famous book that many of you will know from childhood, “Gulliver’s Travels”, it was he who said these words: ‘We have just enough religion to make us hate one another, but not enough religion to cause us to love one another’. HOW DO WE TAKE A STALE MARRIAGE AND TURN IT INTO A DYNAMO OF PASSION AND LOVE? I’m not talking about being dependent upon each other. Most of us are in one way or another, and that only leads to a marriage of give and take. We are all dependent upon the government, some more than others, and I don’t think that leads to a “Loving Relationship”. If I sing “I Love You’s” with the voice of an angel and yet do not possess God’s love for my spouse, I am just an irritating hanger clanging on the closet door. If I can capture the eyes of my spouse with mine, and know their deepest heart’s desires, and shower them with mountains of wealth and luxury, but possess not God’s love in my heart, I am just a vanishing vapor. If I give everything I have to my spouse and even sacrifice my life for them, and yet I possess not the very Love of God, I have accomplished nothing. If you do not possess God’s Divine agape love in your heart toward your wife, YOUR MARRIAGE IS NOTHING! No! I want to say to the world Our Marriage was Something, because God was present in our marriage. We were actively Loving Him and as a result we were actively loving each other! 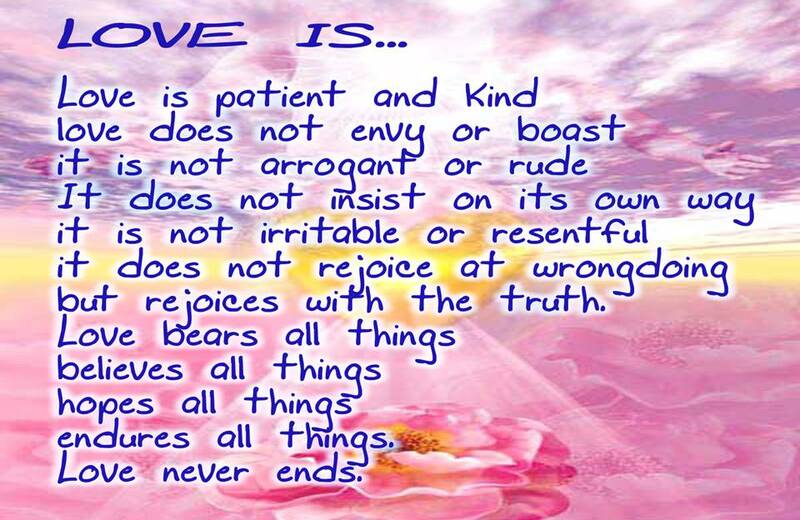 1 Corinthians 13:4-8 (ESV) Love is patient and kind; love does not envy or boast; it is not arrogant or rude. It does not insist on its own way; it is not irritable or resentful; it does not rejoice at wrongdoing, but rejoices with the truth. Love bears all things, believes all things, hopes all things, endures all things. Love never ends. As for prophecies, they will pass away; as for tongues, they will cease; as for knowledge, it will pass away. Charity never faileth: I will actively love my spouse forever! The Bible Puts the LOVING in LOVE! Pursue love, and earnestly desire the spiritual gifts, especially that you may prophesy. 1 Corinthians 16:14 (NIV) Do everything in love. 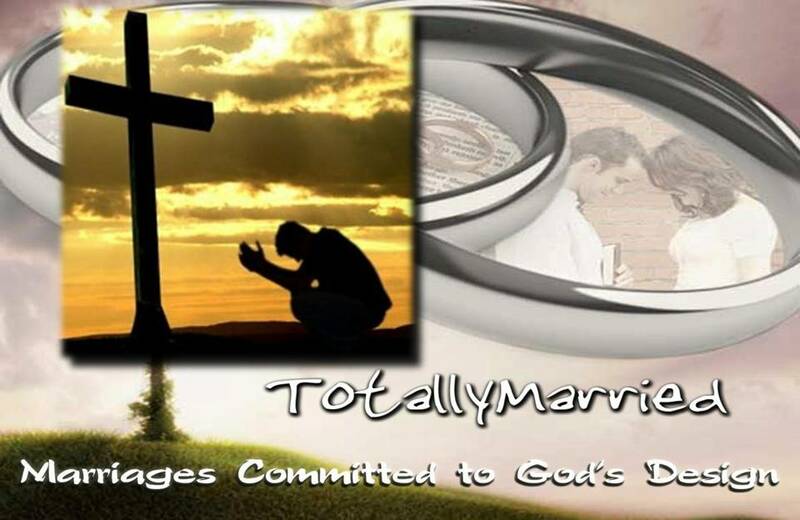 Marriage is an Impossible Union without the Agape Love of Jesus Christ Loving through you. The sooner you surrender your heart to allow God to Love through you, the Sooner you can become TotallyMarried according to God’s Design. Let’s see how we can possess God’s AGAPE love. Let’s see how God can take a nothing and make him a something. God does the same for our marriages, making them dynamo’s of His Love. 1 Corinthians 1:26-31 (KJV) For ye see your calling, brethren, how that not many wise men after the flesh, not many mighty, not many noble, are called: But God hath chosen the foolish things of the world to confound the wise; and God hath chosen the weak things of the world to confound the things which are mighty; And base things of the world, and things which are despised, hath God chosen, yea, and things which are not, to bring to nought things that are: That no flesh should glory in his presence. 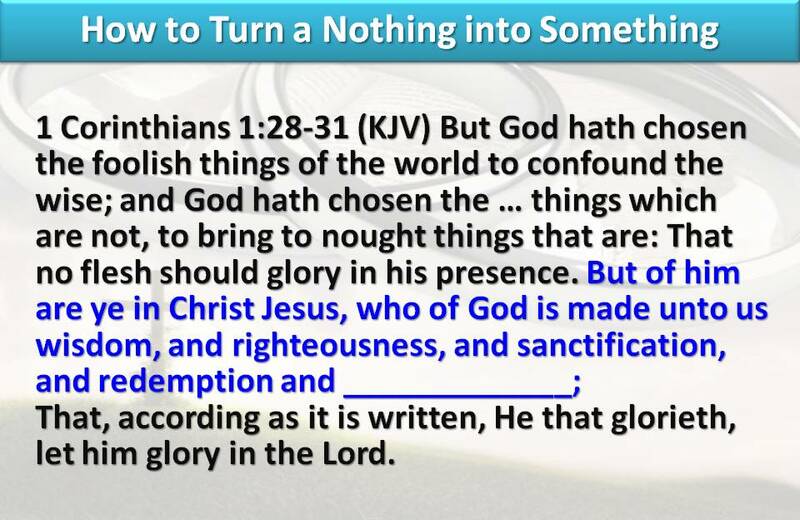 But of him are ye in Christ Jesus, who of God is made unto us wisdom, and righteousness, and sanctification, and redemption and _____________: That, according as it is written, He that glorieth, let him glory in the Lord. We must come to the place where we realize we cannot love our spouse the way God loves them. We must see ourselves as nothing before God. He wants no pride in our lives. He wants only His strength and His love in our lives. 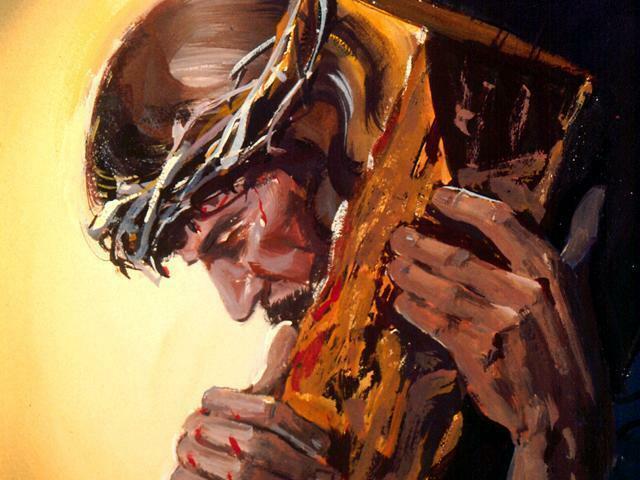 So we go through the Cross in our marriage, realizing that we do not have His love, that we are nothing, and then we say, “Christ lives in me!, All that He has is mine. Christ is AGAPE Love! Let me be a channel of His AGAPE Love! Once we kneel before Him as nothing, through Jesus Christ, God makes us SOMETHING! He fills us with the most powerful Love in the universe – HIS LOVE! God’s love must be allowed to energize you. YOU hold the key to how much you love and how much you are in love with your partner. YOU have it in your mind and heart to act lovingly or not. YOU have it in your power to be loving.But you must be willing to allow God to channel His love through you, to love even the ugliness in your spouse that you have been unable to. Love is not something that just happens. And remaining in love with your partner most definitely will not happen unless you give everything you have to God and then allow Him to change your heart. You must become “loving’ toward your spouse. Notice how it may feel to tell your spouse, “I am loving you,” rather than, “I love you.” The first describes something you are doing, not just something that may be a feeling similar to how you feel about your childhood friend of long ago. To help you see what it means to be ‘loving’ I recommend you have this ‘Loving Kit’ handy at all times. Rubber Band: Romans 8:28 Be flexible, things do not always go the way you want. Band-Aid: Colossians 3:12-14 Take time to offer a healing hand, one full of love & grace. Pencil: Ephesians 1:3 Write down a blessing because of your spouse; add to your list of blessings daily. Eraser: Romans 3:23 Erase the mistakes your spouse makes as they happen. Mint: Proverbs 11:25 Do something to refresh your spouse as you enjoy this mint. Hugs & Kisses: 1 Peter 5:14 Don’t let the sun go down without giving your spouse at least one kiss & hug. Teabag: 1 Thessalonians 5:18 Stop, relax, and thank God for your spouse. Then thank them. Thankfulness goes a long way. 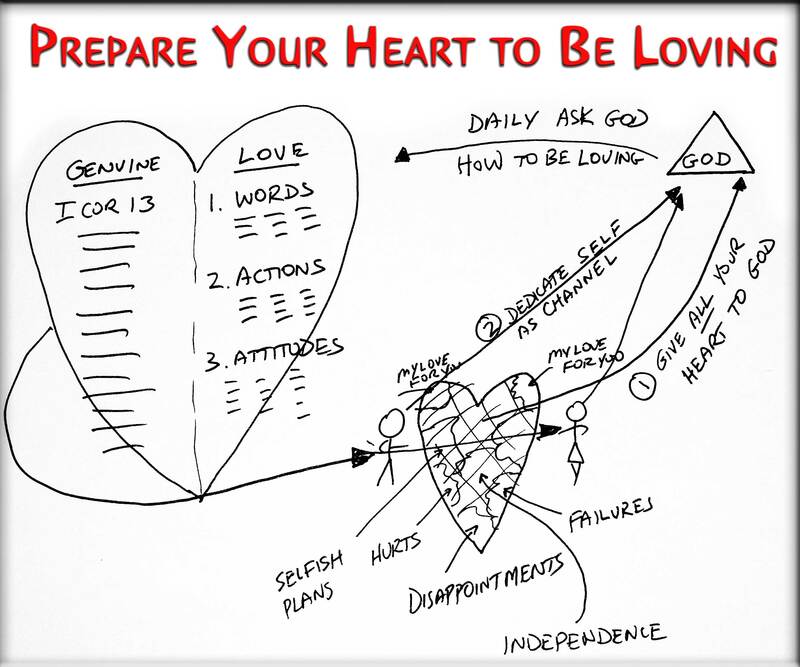 In order to Possess the Love of God in your heart, you probably need to do some HEART cleaning first. If there is any resentment, any hatred, any hurt, any bitterness, any wrong relationships, any regrets, anything you are not thankful for, any wrong doing you are holding onto. You can’t have the Love of God because He doesn’t have all of your heart. You are blocking Him from some area of your life. If your spouse has wronged you and you haven’t forgiven them, you are blocking that area of your heart from God’s love. You will not hold the love of God in your heart! Here’s what you need to do right now: Give your entire heart to God-all the pieces-all the rooms. Hold nothing back. Give your spouse to God; give all those expectations, that honey do list that never gets done. Give it all and say God, fill me with your love and allow that love to overflow toward my spouse. If you want to rediscover those lost feelings for your spouse start by changing the way you view him. Falling into a trap where you only see the negatives in your husband is very easy to do. Make a concerted effort to only focus on the positive parts of him. Be vocal about how much you appreciate those things about him. Tell him and tell others. The more you verbalize what you find appealing about him, the more you’ll start to recognize and appreciate it. Start doing small things for your spouse again. 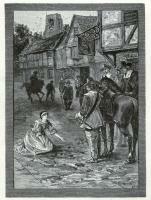 Quite often when a wife (or husband) starts to fall out of love with her husband she also begins to neglect him. If you did certain things early in the marriage, such as making his lunch, cooking his favorite dinner or washing his clothes, do that again. Once you start taking the time to do things for him you’ll likely see a change in him too. He’ll also want to do more for you which will help you to recognize those qualities in him that first attracted you to him. On two pieces of paper write the three questions below. Each partner gets one sheet of paper. Both you and your partner answer the questions then guess how your partner will answer them. (Four answers each). Share your thoughts! Discuss your answers! Then throw it away (or give them to God. Remember, Agape Loving is not about you and your expectations, it is about being a channel of GOD’S LOVE. 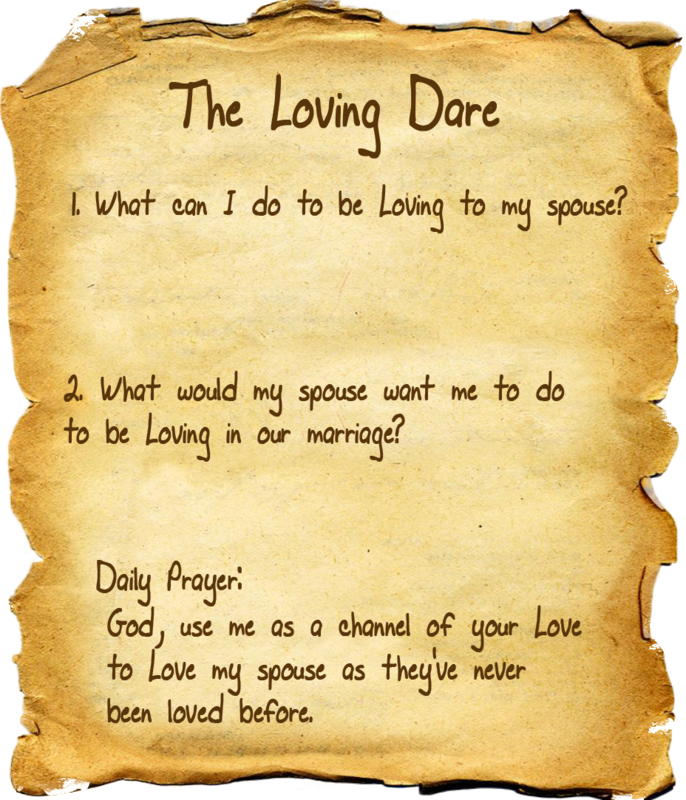 So while it helps to see your spouses wants and needs and be willing to meet them, you must do the thirds step in our Loving Dare, you must daily ask God to love your spouse through you in a way they have never been loved before. 1. What can I do to make our marriage better? 2. What would my spouse like me to do to keep our marriage alive and vibrant? 3. God, will you love my spouse through me as they’ve never been loved before? To what lengths are you prepared to go to silence the clanging, the arguing, the discord in your marriage. To what lengths are you willing to go to change wrong and disrespectful attitudes built up over the years. To what lengths are you willing to go to be Loving toward your spouse. Are you willing to give your heart to God and be used by Him to be a channel of His love toward your spouse. Are you willing to let Gid use you to be actively loving toward His Son or daughter? Because of Jesus willing to go to the Cross, God threw a mantle over your sins, over every hurt and pain you caused Him, and He took the punishment for your sins, and not only that, he sympathised with our sinful flesh, and through the Power of the Cross offers us a way to be transformed from selfish sinners into Loving Saints. Sin, Satan and death have all been defeated through the cross, and you can share in that when you live your life by the Power of the Loving Cross. That’s what God did for us. He didn’t just send a note to us saying He loved us. He didn’t just give us a loving kit. He sent His son to visibly express his Loving Heart & Ways! I do agree with you.. Marriage is not always a bed of roses.. In order for a marriage to work the couple must work together. We STILL Don’t Need ‘No Stinkin God’, Especially a Backward and Intolerant One? Is Tiger Ok Because We Are Just Animals?